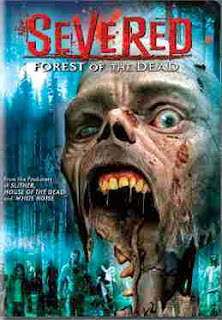 For tonight's movie, I picked out Severed: Forest of the Dead, on Netflix. As far as zombie movies go, it was alright for the first 3/4 of the movie, but only just barely. The end of the movie, however, pretty much ruined it for me. This is going to be a quick review because I don't really want to spend a lot of time bashing movies, especially zombie movies. I mean, it wasn't like the movie was straight out horrible. It was just like they ran out of time or ideas and decided to roll the credits. As for the zombies, this marks the first zombies that were created by a fungus in my month of watching movies. I am not totally sure that it was a fungus, since it looked more like strawberry jelly, but it was the only thing that made sense based on that it came from a tree. It was also too bad that the movie was so inconsistent about the zombies and how they needed to be killed. I did have a lot of fun yelling at this one at least since they had some characters that were just ridiculously stupid. So in the end, I would say that the movie is still watchable and I give it a 2/5. It is another good one to have on in the background of a Halloween party when no one really needs to pay too close attention to what is going on. Going to go straight to the zombie review part since I don't know what else to say about this one. Lots more to still watch and I doubt this will be the worst one. Keep checking back to see what other crazy movies we end up watching in our month of #undeadOctober.